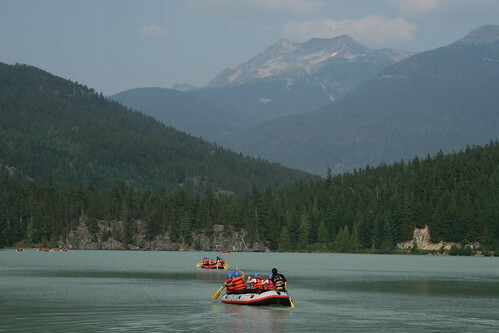 My husband and I just recently returned from a wonderful trip to Vancouver and Whistler in Beautiful British Columbia. Some people might think that Whistler must be a ghost town in the summer, but warm weather activities abound in this well-known skiing hamlet. 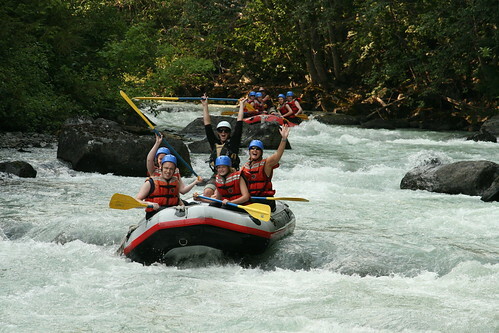 Our first full day in Whistler involved a ziplining adventure with Ziptrek Ecotours and a rafting trip on the Green River with Whistler River Adventures. In addition to a mountain biking excursion on our third day (which I will address in a separate post), we certainly were not at a loss for things to do there in the middle of August. Beginning with the Ziptrek tour, we started our morning by meeting our tour group near the village gondola and our guides then led us to another location to put on our gear and harnesses. 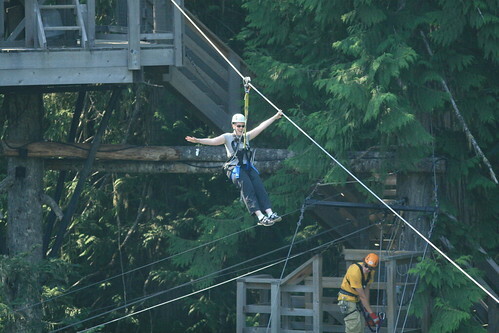 The first of 5 ziplines is a warm up line next to the village gondola and is nowhere near the beautiful scenery of the rain forest and Fitzsimmons Creek that they brag about on their website. But once everyone in our group of 10 had the chance to do a practice round, we were off in a van to where the real magic happens: the rain forest. 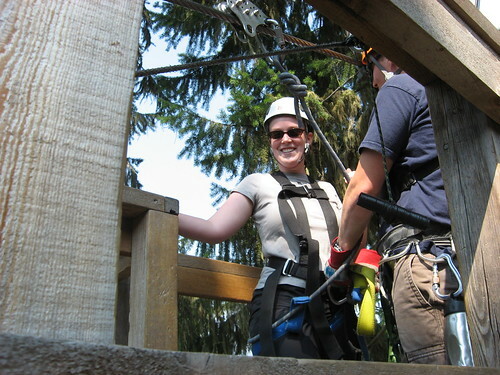 The satisfaction of the tour you take with Ziptrek is that it's not just an adventure, but it's also educational. The guides do an outstanding job to, while walking you through the rain forest canopy along the boardwalks and suspension bridges, explain in detail the ways Ziptrek helps the local ecology, and what humans need to do in order to work toward sustainability. For someone like me who is always looking for ways to make greener choices, it was nice to know we were supporting a low-impact tour company during our vacation. 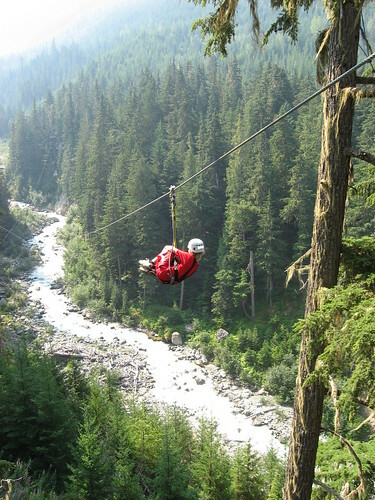 Ziplining through the trees and right above a mountain creek is one of those experiences that makes every adult feel like a kid again. If you're not afraid of heights and you like going fast, I'm not sure how many people who come to Whistler would have the audacity to pass up this experience. I can hear the sound of the water rushing down the river as I'm posting these pictures. Or maybe that's just the sound of my computer fan. Our guide Sheree (she's the daredevil in the back of the raft) was from New Zealand and in addition to being entertaining just by listening to her accent alone, she was also a laugh a minute. If she wasn't telling us funny stories, she was intentionally paddling us toward big boulders only to say, "Oh man! Where did that rock come from? You guys need to wake up and pay attention!" If we weren't laughing at her running us into boulders, we were cracking up at her tales of foreign tourists going on rafting trips who didn't speak English and her having to teach them how to raft without them understanding a word she said. Those stories all began when we all didn't know what to do when she shouted "Forward!" instead of, "Forward paddle!" 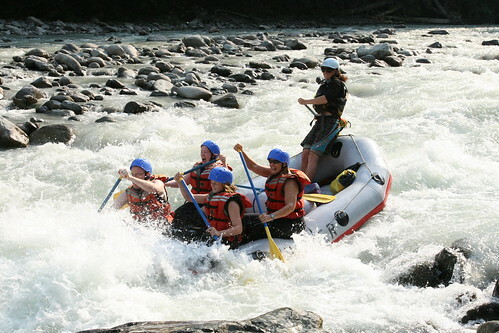 It was quite hilarious because we all just sort of looked at each other and then hunched ourselves forward in the raft. We didn't get that she meant to paddle. 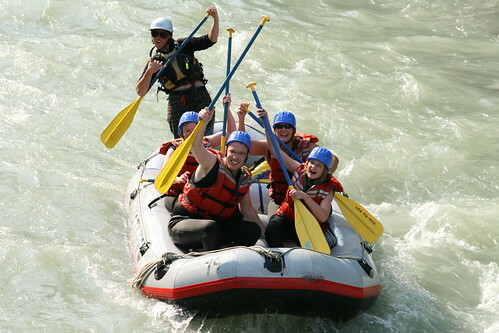 It was then through her laughter that she had to tell us, "No, forward is just short for forward paddle." This day of our trip was just smiles and fun all around. When I turned out the light to go to bed that night all I could think was, I'm so happy we also decided to go to Whistler for our trip to Vancouver. 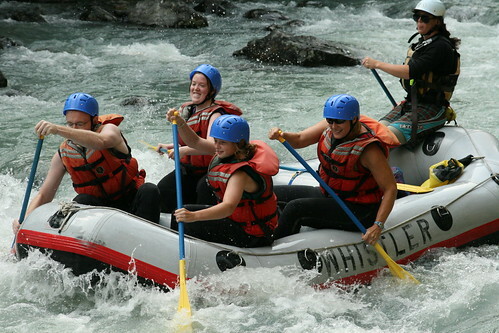 So with a full day like the one we had just experienced, I'd have to say that for those people who only see Whistler as a place to go skiing, give it a try in the summer. You won't be disappointed. Thanks for the warm words :-) Hope you had an awesome time in Whistler. Sunny Wishes from the Village.